As I mentioned several weeks ago, once a month I’ll use a Saturday Seven post to talk about a poet that I like. Emily Dickinson was the poet I talked about in March, and Langston Hughes is my choice for April. 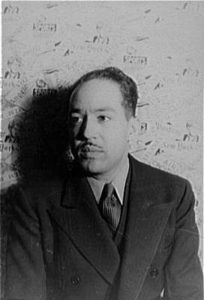 Langston Hughes was one of the leaders of the Harlem Renaissance in the 1920s, and he also invented an entirely new style of poetry called jazz poetry that has influenced generations of writers and other creative folks. His writing style was conversational. The poems he wrote often sounded like something friends might say to each other over a cup of coffee or while playing cards. I also love the fact that he wrote about black, working class people, a portion of the population that was generally ignored altogether by literary circles when he was alive. Since Mr. Hughes lived until 1967, the copyrights on his poems have not yet expired. I’ll be sharing brief excerpts from them and then linking to a site where you can read the entire poem. 4. Who but the Lord? the man they called the Law. Actually, I considered including Raisin in the Sun in my Saturday Seven. Many of these Hughes poems I’d never read, though. Thanks! Raisin in the Sun is probably Hughes’ best-known poem, and for good reason. Isn’t the imagery in it fantastic?! I used to write poetry years ago, but I haven’t written anything new in ages. Your comment makes me wonder if I should take that hobby up again. Thanks for playing! I have to admit, I’m familiar with Hughes’ name, but I’ve never read his poetry. I’ll have to give it a whirl though. I hope you enjoy it if you give it a try. He was a very unconventional writer in all of the best ways. Nice. I’ve only ever read Raisin in the Sun. I’m off to find more of these to read. Thanks! I think his poetry is more “reachable” to common folk. There are times I read poetry and it’s so far out there I don’t even understand it. What’s the point then? His is just words, strung together magically, that still just make sense. Great choice! I couldn’t agree with you more on both points. So glad you liked my post.